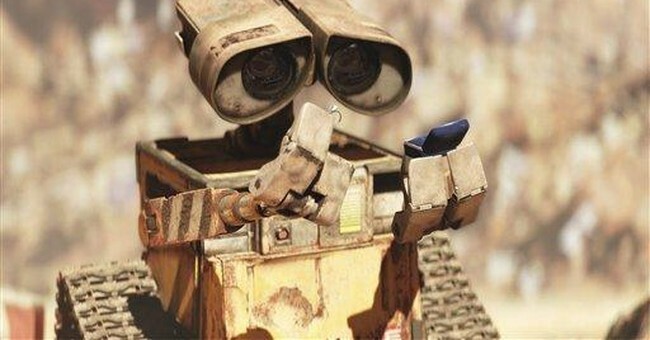 The lead character in the Pixar film “WALL-E” is both an acronym (Waste Allocation Load Lifter—Earth class) and a lonely robot with a personality. While Pixar has mastered the art of animation, it is the implicit message this film conveys which makes it much more than a mere cartoon. Some conservatives have written the film off as anti-capitalist propaganda. If the intent of capitalism is to cater to the basest instincts of the human heart, requiring us to indulge our every whim and desire, leading to a dependence on government, then I guess I, too, am an anti-capitalist. However, capitalism can only arrive at that end when all of the restraints of personal responsibility are removed. In this sense, WALL-E is a brilliant exposure of liberalism’s flaws. WALL-E is the story of what results when a liberal vision of the future is achieved: government marries business in the interest of providing not only “the pursuit of happiness” but happiness itself, thus creating gluttonous citizens dependent on the government to sustain their lives. The result is a humanity consisting of self-absorbed, isolated individuals with no affection for others, who thus defy what it means to truly be human. Not so fast. While in the storyline humans certainly have laid waste the planet, and the government’s answer to the crisis is the removal of humans (which is also Al Gore’s solution), 700 years after the last human has left the planet it becomes quite clear that the earth needs humans just as much as humans need the earth. After all, in the Bible we learn that humans were created as caretakers for the planet: “And the Lord God took the man, and put him into the Garden of Eden to dress it and to keep it” (Genesis 2:15). WALL-E exposes a fundamental flaw in the liberal worldview. In their well-intended desire to lift people out of despair, liberals often fail to factor in the depravity of the human heart. Offer a man the opportunity to get something for little or nothing and the ultimate end will be a man who believes himself entitled to everything for little or nothing. The Buy ’n Large metaphor in WALL-E is not an attack on capitalism. It’s an attack on the government’s co-opting of the entrepreneurial initiative of its citizens, micromanaging it through mandated outcomes and compulsory taxes to the point that there is no longer an incentive for individuals themselves to produce. As the government usurps the role of producer, it creates citizens who are fat and lazy consumers, entitled and dependent, with no sense of their own responsibility to make any contribution at all to their well-being. In WALL-E’s world we’re all consumers, and an economy with only consumers and no producers cannot be sustained, no matter how many “tax rebates” the government provides to encourage even more consuming. Rather than deriving its just powers from the consent of the governed, contemporary government derives its powers through the seeming benevolent control of the governed to which we readily consent because it feels so good. Liberating ourselves from our addiction to government benevolence requires the hard work of personal responsibility, a lesson that for the most part isn’t being taught in our public educational institutions or in the decisions handed down by our judicial system. If the explicit message of WALL-E is an exposure of liberalism’s ultimate end, the implicit message is the essence of conservatism. Conservatism derives its name from its fundamental tenet: to conserve, to maintain the status quo, which often requires a returning to the practices and policies of an earlier time. Liberals recoil at the notion that something earlier or older could possibly be better. After all that’s why most liberals would rather be known as progressives. But progress devoid of an historical orientation, based only in our fascination with the novel and a rejection of all things classic, may take you into a promising future but ultimately brings you back to earth and the reality that what has been is what will be, and what has been done is what will be done (Ecclesiastes 1:9). Additionally, WALL-E is an appeal to return to our humanity, to free ourselves from captivity to an ever encroaching technology. Human beings need real conversation, not communication mediated through an electronic device. In this sense WALL-E is an Orwellian depiction of the future we are even now living, one where there is a whole lot of communication taking place but very little conversation, and no love. In the process, the robots have become what humans ought to be—relational and loving—and humans have become robots, disinterested and unaware that anything at all is occurring outside of their limited technological universe. Resisting the siren song of technology will require all out war against it, not just merely a passive resistance. It means tuning out, turning off, shutting down, unplugging. It means, in essence, being unavailable. It means that when you reach out and touch someone you actually do. The personal liberty promised by the gadgets bequeathed to us by the likes of Bill Gates and Steve Jobs have in reality enslaved us to an anticipation of the next personally liberating device. WALL-E is a call to an armed resistance against two very real enemies. First, government control of every aspect of our life and second, our own depraved hearts which are so easily lulled into a technologically-induced passivity. The second threat creates the opportunity on which the first threat capitalizes. Conquer the second threat and you’ve eliminated the first. We have met the enemy, and he is us.